The S&P 500 and Dow Industrials closed Friday with small losses while the NASDAQ Composite eked out a gain after House Republicans, fearing insufficient numbers to pass a healthcare replacement plan, withdrew their legislation shortly before a scheduled vote. The setback cast doubt on the passage of President Trump’s other pro-growth policies, including tax reform and infrastructure spending. Friday’s action sealed the S&P 500 with its largest weekly decline since a 1.9% loss during the week ending November 4th and its second weekly decline this month. The benchmark index ended the week 2.2% below its most recent 2,396 all-time high on March 1, 2017. For the week, the S&P 500 fell -1.4%, the Dow Industrials declined -1.5%, and the MSCI EAFE (developed international) lost -0.04%. As Chart 1 above illustrates, demand and supply conditions supported higher oil prices earlier this year. Speculative trades in future markets also contributed to crude oil’s rise on expectations that the Organization of Petroleum Exporting Countries (OPEC) and non-OPEC countries would implement agreed-upon production cuts. Nervousness about record levels of speculative trading, rising U.S. supply and growing doubts about production-cut compliance sparked oil’s recent price drop (green line). 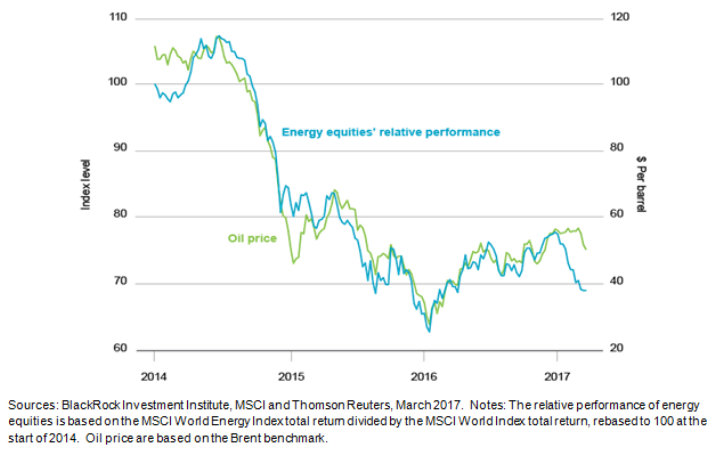 Global energy stocks (teal line) appear to reflect an even more bearish price outlook, and further unwinding could pressure prices further in the short term. While oil prices are hard to predict, as production cuts hinge on an uncertain political environment, BlackRock strategists forecast oil to trade mostly sideways over the next few months. This as OPEC members show a disciplined approach in cutting oil production, and U.S. inventory growth may stabilize as oil refiners increase purchases into the spring and summer driving seasons.